As the iPhone has matured, its speaker has gotten a little better, but it’s still not great. Listening to music, or any audio can leave a lot be be desired. The same is true for the iPad. 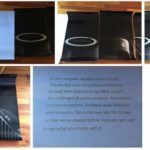 Logiix has a solution for you that not only looks great, but is affordable and small – making it very portable. Take a look at my video review of the Blue Piston wireless speaker. As I mentioned, the Blue Piston is nice and small. It comes in at 2.05″ tall and only 2.44″ in width. The size makes it easy to carry around with you anywhere you go. But don’t let its size fool you. The Blue Piston packs a lot of power, giving you crystal clear sound. The Blue Piston has a brushed aluminium outer shell and comes in a variety of colours. As an added feature, it also allows you to receive phone calls and use your iOS devices voice commands all handsfree. Connecting it to your iOS device is simple. It can be done via bluetooth and supports AUX-IN audio inputs. As for the battery life, Logiix states it gets up to 8 hours of audio playback before having to charge it, but I’ve gotten closer to 10 hours using mine. 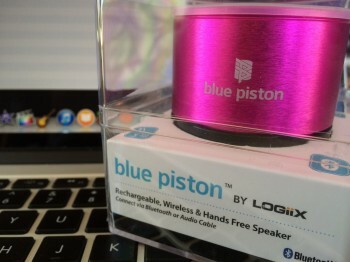 I haven’t used the Blue Piston as a wireless speakerphone all that much, but Logiix claims you get about 4 hours of talk time. Overall the Blue Piston is a great product. It delivers solid audio in a compact form. If you’re in the market for a portable speaker for your iOS devices, make sure to give the Blue Piston a look.